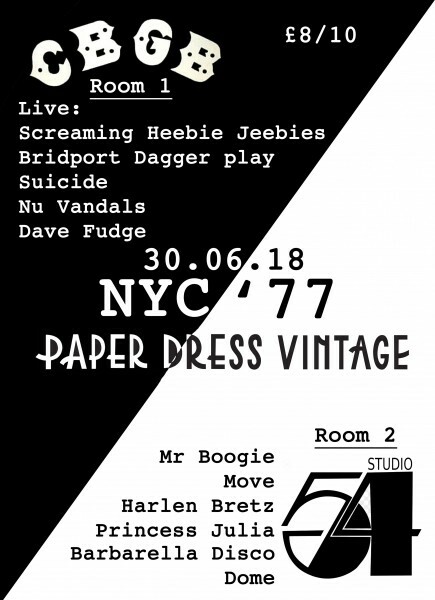 Two night time institutions celebrated under one roof at Paper Dress Vintage for one night only. Limited advance tickets just £8 here! Jim Rhesus and friends will be focusing on the raw energy of the lower east side scene by playing the Ramones and some rare tracks from the time. Hold onto your hats this is going to be a whirlwind of a show! Super Hero Funk, Disco & Dance vibes… A bunch of top shot superpower cats playing spot on dance licks. get ready to wet your pants on the boogie rug and unleash your latent superhero..
World Funk Grooves! Producer, bassist & composer Matteo Grassi and singer Ella Bites lead a collective of top professional musicians to help you get your Friday night funk on! Serving up old style punk sounds with a trashy yet funky flair!